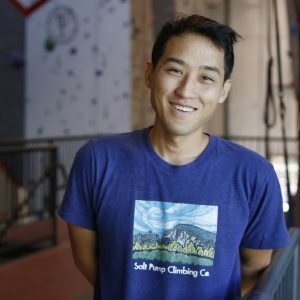 Staff - Salt Pump Climbing Co.
Kai has been climbing since Salt Pump opened in July 2015, but has learned a lot since then and is psyched to share that knowledge with anyone and everyone who is psyched to learn! Kai has around eight years of experience teaching and assisting various classes, mostly dance related. As an aspiring travel blogger, photographer, and writer Kai is often taking pictures of our kids programs for Facebook. Kai also heads up our pro shop and retail space, carrying the widest selection of climbing gear in Maine! Trish has worked with adolescents in an outdoor setting for programs all over New England and in the Rocky Mountains. Originally from the Mount Washington Valley in New Hampshire, she loves spending her free time adventuring in the White Mountains. 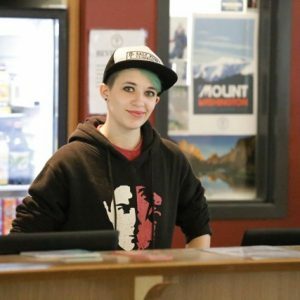 Having grown our youth programs, she's taking those same talents and growing the gym as a whole in her role as General Manager. Trish is currently studying to be a nurse, working on EMT certification, and advancing her skills in climbing and sea-kayaking. Read a recent blog post about her. Henry Fitts is a Pine Point native who has been a fixture in the Maine bouldering scene for over a decade. He can often be found in Salt Pump’s Training Pagoda campusing and working on his core. One of Henry’s most notable features is his patient and positive nature, which makes him an ideal coach for the Youth Team. When he is not climbing, he can be found pulling tricks on his unicycle at the region’s skateparks, surfing the shoal breaks of southern Maine, and putting his professional culinary talents to the test. In the last couple of years Henry has been investing his creative energy into routesetting at Salt Pump, including for Youth Competitions. 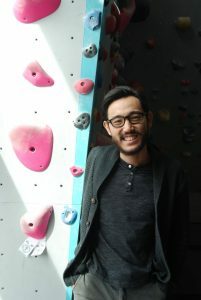 His setting is known to have lots of large holds with wild, inertia-based movements in between them, but he has been diligently pushing his setting prowess into all styles of climbing. We know that his energy and passion for climbing will be a driving force in the development of the Salt Pump Team. Although not a native New Englander, Tino has always felt the most at home among the craggy mountains of New Hampshire and the rocky coast of Maine. A self-taught climber, he cultivated his skills on east coast granite before adventuring off to learn the movement taught by climbing on different types of stone. 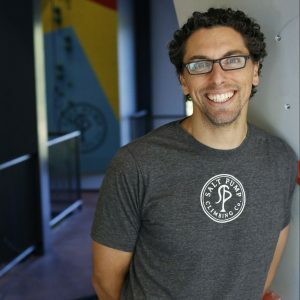 He is inspired to provide memorable experiences for people to broaden their movement patterns, get stronger, and ultimately grow as climbers and people. Whether it’s pulling on rock, duck diving through a wave, or taking in miles on the trail, he’s just happy to be outside and with his family. Every once in a while, you’ll catch him hucking himself around on different stones around the northeast. Don’t hesitate to say hi, buy him an espresso, or ask for a spot; he’s a self-proclaimed amazing spotter. Read an interview with Tino. Taki has alternated living in Japan and the US throughout his life. 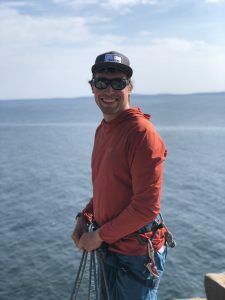 He first landed in Maine for college, where he was introduced to rock climbing on the gritty urban rocks of Great Falls in Lewiston. 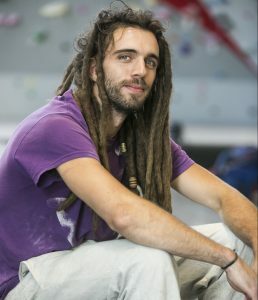 He was hooked and continued to look for boulders any chance he got and was a regular at the Maine Rock Gym in Portland. Since then, Taki has climbed throughout the world, putting up first ascents in Peru, Patagonia, and the Wind River Range of Wyoming, but he has an incredible soft spot for New England climbing. After working as an outdoor educator and then as an attorney for a major law firm in Tokyo and New York for seven years, he moved back to Maine, married his sweetheart, Natalie, and started working on his dream that is Salt Pump Climbing Co. Taki wants Salt Pump to be a place that reflects and celebrates the increasing diversity of the climbing world and is looking forward to climbing with you whenever and, in particular, on his dojo nights. Mark Richey has two passions: climbing and wood. As a kid growing up in Reading, MA, in the 1970s, Mark realized woodworking could be his ticket to climbing and traveling the world. In 1983 he and his wife Teresa founded Mark Richey Woodworking, a business they grew into an industry-leading architectural manufacturing firm serving clients such as Harvard University and the Museum of Fine Arts. In truth, Teresa was often really running the business, so Mark could sneak off to mountain ranges around the globe, ticking off notable first ascents of difficult lines. 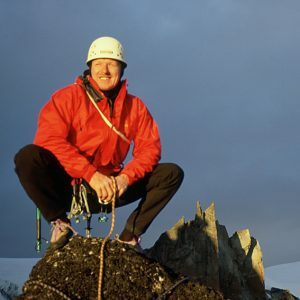 Mark’s climbing career culminated in 2012, when he was awarded the prestigious Piolet d’Or for making the first ascent of Saser Kangri II, then the second highest unclimbed mountain in the world. When he’s not climbing, Mark is hiking, diving and hanging out with his wife and their daughter Natalia. A native Vermonter and product of a hyper-active youth, Zack Sawyer unfortunately did not discover climbing until he left his beloved New England. With a philosophy degree in hand, he returned north to satisfy both his newfound desire for climbing and friendly people! He is captivated by the beauty and importance of the teacher-student relationship in navigating these worlds and mastering this relationship, no matter how small or peculiar it may be. Zack looks forward to learning all he can from the fascinating Salt Pumpers he is fortunate to interact with each day! 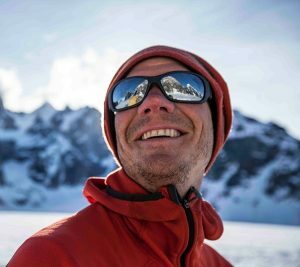 From the teahouses of Khumbu Himal to obscure glaciers of the Alaska Range, Freddie is an alpinist known for his infectious energy and original lines of ascent. He graduated with a degree in history from Dartmouth College, though he probably spent more time roaming the White Mountains than he did studying. After school, he fell into the guiding/climbing lifestyle for many years, which afforded him the opportunity to travel and climb extensively in such places as Alaska, Patagonia, Yosemite Valley, India and Nepal. In 2008, Freddie joined the Mountain Hardwear athlete team. In 2010, he published the narrative non-fiction book “One Mountain Thousand Summits: The Untold Story of Tragedy and True Heroism on K2.” Wilkinson is also a partner guide at Cathedral Mountain Guides, based out of North Conway, New Hampshire. When not writing or away on expeditions, he enjoys amateur lamb-farming with his wife Janet and dog Tagger. Meet Salt Pump's Sales & Marketing Manager, John. John discovered rock climbing when he was in school at the University of Maryland. 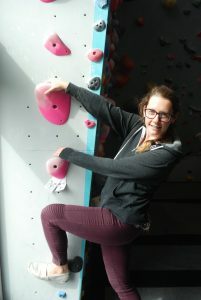 Working at the university's outdoor climbing wall, it exposed him to how climbing can be a great excuse for travel. Since then, he's taken climbing trips to Arkansas, California, France, and Taiwan. He and his family moved up to Maine from the sandstone mecca of Chattanooga, TN, where he has sent double digit boulder problems while growing businesses like The Crash Pad, a climbers' hostel and base camp. When he isn't devising new ways to broadcast Salt Pump, he's spending time with his 3 dogs: May, Milly, and Acadia.